On Friday (January 2nd 2004), armed with information from the Internet on Mountain Hares in the Peak District, and even a grid reference from where they could be seen (thank you, Gordon), I drove up to the Snake Pass and parked beside the road where the Pennine Way crossed it. The forecast for Friday had been a clear sky, but as I set off along the footpath, no sunshine penetrated the low grey cloud anywhere. 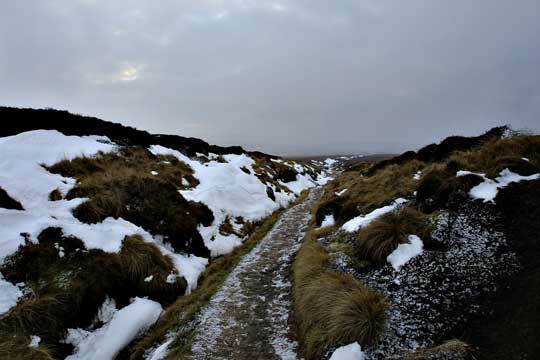 The first section of path across the moor was deep in snow and slush, when very little could be seen on either side, but as the path rose towards Alport Low, the going got better and the landscape around me became more wintery. The telephoto lens and tripod for photographing the hares was in my rucksack, and I had on the camera a Sigma 14mm lens which I have recently purchased. Wonderful to be able to take true wide-angle pictures again - my digital SLR camera had transformed my previous shortest lens (28mm) into a normal lens, and I have had to resort to my old film camera for anything wider. 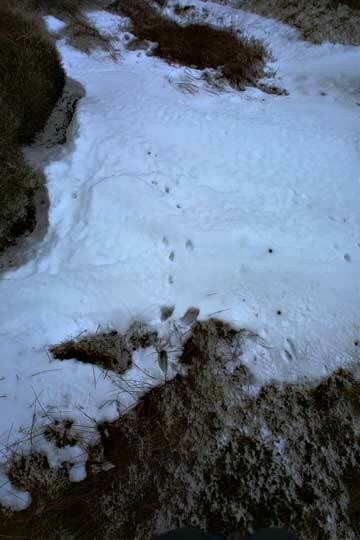 Around Alport Low, I began to see hare tracks with increasing frequency, though none of them looked fresh. As I made my way around Hern Clough, visibility worsened considerably as I met the base of the cloud, and a light sleet/snow floated in the air. After a while, I decided that continuing to Hern Stones, which I was going to use as a viewpoint for hare spotting, was going to be no better in the conditions than where I was, so I moved away from the footpath and ate my snack (ryvita and cheese slices - Atkins diet). I then spent some time moving around quietly among the heather hummocks, with binoculars getting increasingly wet, with not a single hare to keep me company. Eventually, I decided that enough was enough, and retraced my steps (and lots of other people's!) back along the Pennine Way. 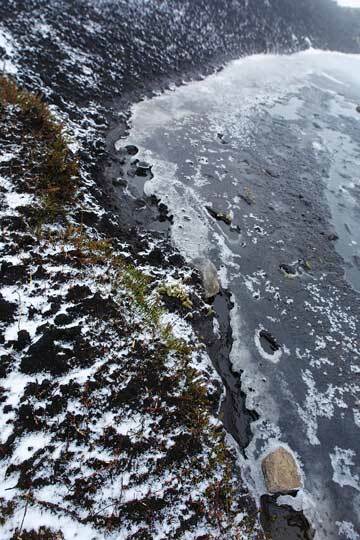 I took my time, delighted by the strange patterns and shapes which the snow revealed and threw into relief amongst the peat hags, and attempting to capture some images which did justice to the bleak but strangely beautiful landscape around me. 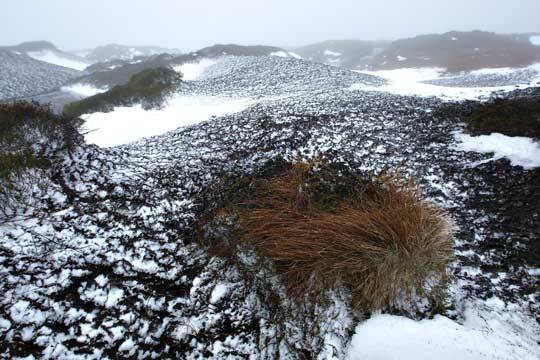 As I slipped and slid back down the path, the weather forecast performed its magic. 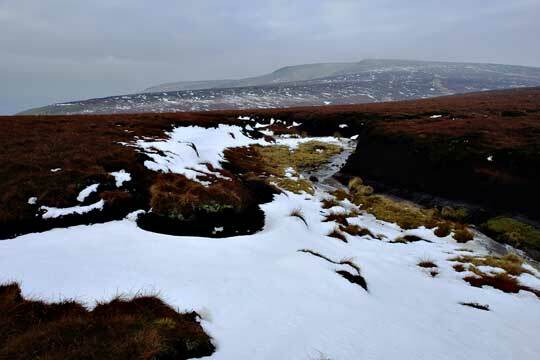 A small discontinuity in the greyness above Kinder before me gradually deepened and extended. The edges became wispy and lo - small patches of blue sky appeared! By the time I got back to the car, they had sealed up again and greyness ruled. Gathering Hill with Higher Shelf Stones in the background.